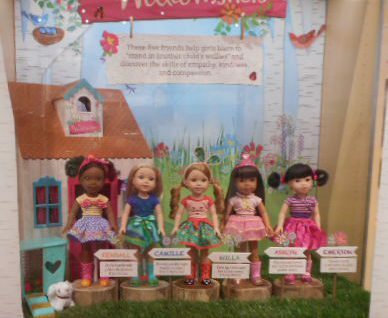 A few days after I bought Lea at the American Girl store I reviewed her. (I’m wincing at my photography by the way) Lea is a really beautiful doll, a lot more thought out than Gabriela seems to be. In which I post a photo shoot of Lea in the snow. I love snow on Lea’s hair. March This is one of my favorite pictures I’ve ever taken of any of my dolls. It’s actully a post about how to make the dress Eileen is wearing, which you can read here. Though I didn’t post much in April I really like this picture from Joy’s Journal part seven. In fact I liked it so much I turned it into a Joy’s Journal poster which you can see here. In this post I opened my new doll Mia that I had found at a thrift store (for 1$!) and sent to the doll hospital for a new head. Yes, all of my dolls are watching me open her. (What?! Mom made me wait for her and she was on the phone. I had time!) I also reviewed her. I love this doll blender that I made. In which I post a craft that is not really a craft but a silly way of saying how I did everything wrong. A photo shoot of Eileen and one of my guinea pigs for AGDollawesome‘s photo shoot challenge. I showed y’all how to make a paper pumpkin for your dollhouse. Last but not least is a part of Joys Journal. I want this year’s posts to be at least as good as 2016, hopefully much better. Here’s to a grand 2017!